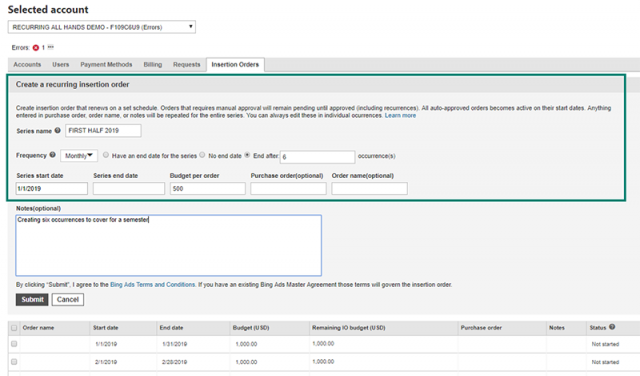 Bing Ads announced a new feature that allows you to set up recurring insertion orders. That should help agencies and advertisers not forget to manually create IOs for their ad campaigns. You can set them up in a specific frequency and only change them when you need to. Bing said "with recurring insertion orders, you can create a series of insertion orders that automatically renews according to a set frequency. You no longer have to worry about that next IO, and you still have the flexibility to manage IOs individually." Within the Accounts & Billing page, click on the Insertion Orders tab. Clicking on Create order now gives you the second option of Create a recurring insertion order. You can learn more about how to manage these IOs in Bing Ads over here.